Let our team of experts explain the different options and benefits of these now must have features of any landscaping project. We have built many great outdoor kitchens that our clients love great for family bbq or when hosting the next neighbourhood party. Each one is unique and custom built can be nat gas bbq or wood smoker they can have bar counters cabinets electricity water pizza ovens. Our outdoor fire features will keep you warm on those cool evenings and let you experience another way to enjoy your backyard even year round. We have built many wood burning, natural gas fireplaces, fire pits and fire bowls. 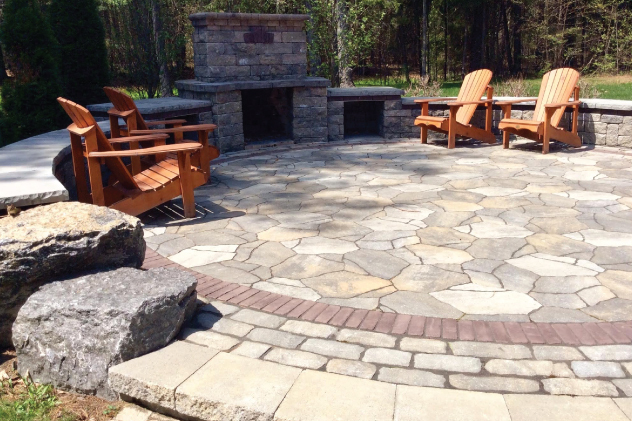 We can custom build out of interlock stone ,stainless steel, concrete or natural stone they can be freestanding or built in.we hire only certified gas installers to meet building code requirements. Our extensive experience in outdoor lighting started long before nights caping was as popular as it is today.we were one of the few companies in the Kanata area to use lighting as another part of exterior landscaping.let us install a lighting plan on you property not only does it make elegant statement and make your property unique but also is a security and safety benefit.so enjoy those summer evenings in the backyard.